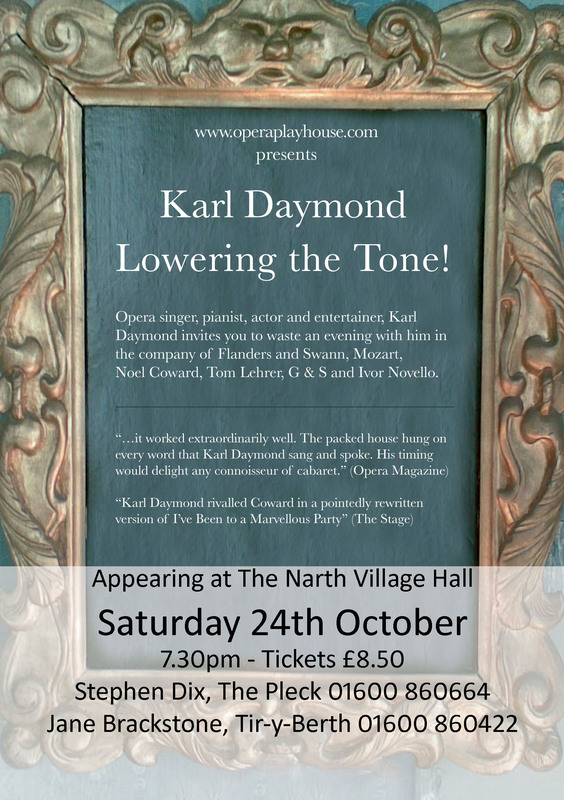 Opera singer, pianist, actor and entertainer, Karl Daymond, invites you to waste an evening with him in the company of Flanders & Swann, Mozart, Noel Coward, Tom Lehrer, Gilber & Sullivan, and Ivor Novello. Tickets are £8.50 and available from Stephen Dix at the Pleck, 01600 860664, and Jane Brackstone at Tir-y-Berth, 01600 860442, or book online (below). This is Karl’s one-man show, Lowering the Tone, which he performs in venues throughout Wales under the Arts Council for Wales Night Out rural arts touring scheme, Noson Allan. Karl has appeared as a principal baritone with many major opera companies, orchestras and festivals in the UK, Europe and the USA, including English National Opera and Welsh National Opera, and at The Royal Opera House, Covent Garden. You may know him as leader and the driving force behind The Singing Club of Chepstow, Usk and the Forest of Dean. We are very grateful to the Arts Council of Wales for supporting this event, and to Karl for coming to The Narth.